St. Augustine has long attracted and inspired artists with its historic, coastal and architectural beauty. 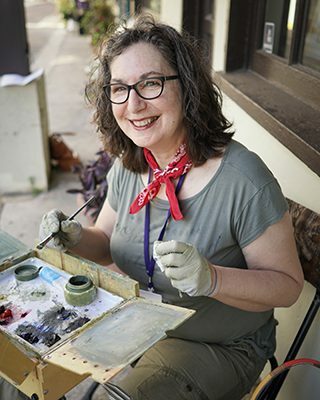 We spoke with two artists participating in the 2018 Plein Air Paint Out, to learn their methods and inspiration in the nation’s oldest city. Their work will be featured at the St. Augustine Art Association May 4 – 27, 2018. Q: Why are events like the Plein Air series by the St. Augustine Art Association so important to the community and to local artists? A: Art defines a community. Art creates the soul of a place. And St. Augustine drips with culture and art. The Art Association is a huge support for local artists – it encourages them, and is the base of operations for many local artists. 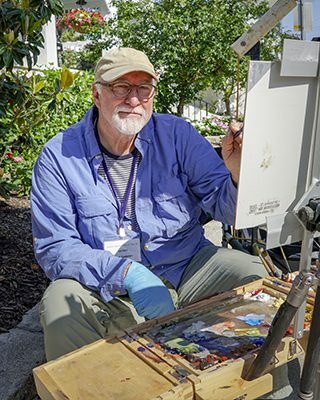 Their hosting these plein air events tells the world that St. Augustine is important and current in the art world. And St. Augustine has attracted many artists through the years. For artists, this city is a paradise. St. Augustine screams with interesting painting subjects. The local historic places and wilderness is like none other in the world. Unique. Attractive. Paintable. A: With its great weather and rich heritage, St. Augustine is a perfect place for artists to gather and to paint. This exhibition by the St. Augustine Art Association draws artists both local and regional and gives access and accommodation to painting sites that would otherwise not be available to artists. Also, it’s a public event that draws tourists and locals alike to observe and interact with the artists and be a part of something truly special. Q: How has St. Augustine changed for the better over the last 10 years, particularly in the realm of arts and culture? A: St. Augustine has always been known for its art. Artists move here from other places, attracted to the art community and the unique locations in which to paint. In the past 10 years, I’ve seen galleries come and go. Artists move here and move away. One constant: The Art Association. STAAA has grown. I’ve noticed much higher quality art than ever being included in its shows. Plein air has become popularized internationally over the past 10 years. A few years ago, we formed a local plein air group that meets and paints around the area every week. You can see us downtown, on the Bayfront, and in the back marshes and beaches. A: The St. Augustine Art Association gets better each year. Under the current leadership, and with its many exhibitions and art promotions, the St. Augustine Art Association has become a destination for lovers of art and culture. It is one of the most popular attractions in St. Augustine and it is now a focal point for visitors to St. Augustine.